Bob Zuppke was head football coach at the University of Illinois from 1913 to 1941, serving longer than any other Fighting Illini coach. Born in Germany in 1879, his family moved to Milwaukee, Wisconsin when he was two-years old. Zuppke began his coaching career in 1905 in Muskegon, Michigan, and in 1910 he accepted the director of athletics/head coaching job at Oak Park & River Forest High School, where his duties included overseeing football, track, baseball, soccer, basketball, and swimming. During his three-year tenure, "Zup" put Oak Park on the map as one of the greatest incubators of college athletes. His football teams won three straight championships and outscored their opponents 1,038 to 47. In his final year at the high school, his teams won championships in football (major and lightweight), soccer, swimming, and track. 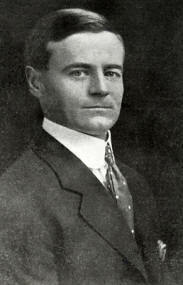 In 1913 he accepted the head football coaching position at the University of Illinois. One of the great innovators of the game, Zuppke introduced the spiral pass from center, the onside kick, the flea-flicker, and the screen pass, as well as the offensive huddle. Many talented players were lured to Illinois during the Zuppke years—the most famous being College Football Hall of Famers: Bart Macomber (a 1913 graduate of Oak Park & River Forest High School), Chuck Carney, Bernie Shively, and Harold "Red" Grange. During his 29 years as head coach, the Illini won 132 games, lost 81, and had 12 ties; his teams won four national titles between 1914 and 1927, and seven conference championships. Bob Zuppke was inducted into the College Football Hall of Fame in 1951. He died in 1957.